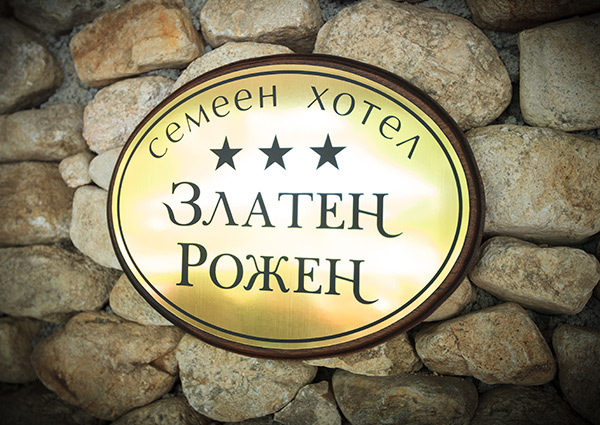 The Zlaten Rozhen hotel (Golden Rozhen) is a three-star boutique hotel located in the immediate proximity of the Rozhen Monastery, in the center of the Rozhen village, and 6 km away from Melnik, the smallest town in Bulgaria. The region is known for its mild climate, numerous sunny days, and fresh air that are the main factors and guarantee for the full value of our guests’ recreation. The hotel offers wide opportunities for relaxation, sports, and entertainment, as well as wine lover/connoisseur/oenophile/sommelier tourism, and wine degustation. It has been built on three floor levels, and is operated all year round. It offers a clever combination of the Bulgarian Renaissance culture, so typical of the region, and the luxury and modern amenities guaranteeing the visitors’ comfort. At the hotel’s first floor level, a unique degustation hall can be found where professional sommeliers and clients can do degustation of wines being the entity’s own produce. In the tavern located on the second floor level and arranged in an old-time life style fashion typical of the Melnik region, with a capacity of 130 seats, we offer delicious specialties of the Bulgarian national cuisine, and a rich assortment of drinks and wines produced of what has come from the entity’s own vineyards. The third floor of the complex includes 12 luxury double rooms and one apartment combining coziness and comfort. The hotel disposes of Internet, cable TV, telephone connections, and a parking facility. The region where the Zlaten Rozhen hotel is situated is rich in sightseeing locations that our guests can visit. Near-by are: the “Pirin” National Park, the Melnik Rock Pyramids natural phenomenon, one of the biggest and most well preserved monasteries in Bulgaria, the Rozhen Monastery. In proximity is also the Ruppitte natural site, together with the “St. Petka, Bulgarian” monument church, as well as the “Samuel Fortress” natural museum park. Both sightseeing locations have been enlisted on the One Hundred National Tourist Sites list. The tavern features the old-time style typical of the Melnik region, with a capacity of 130 seats in total. It is divided in two halls: a main one and a “HUNTING RECESS” VIP hall decorated with lovely versicoloured vitrages, hunting trophies, and a fireplace, all laid out in an attractive hunting and folk-style design fashion. The tavern also disposes of a large summer terrace with a view to the unique one-of-a-kind Melnik Pyramids! 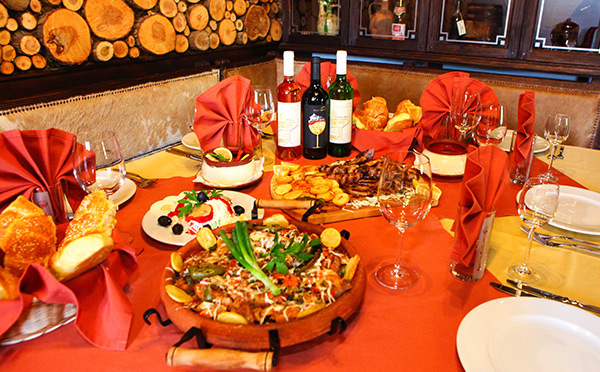 We offer delicious specialties of the Bulgarian national cuisine, and a rich variety of drinks and wines produced of the entity’s own vineyards’ fruit.